Several Cape Region juniors played in the 2017 Philly Junior Tour Beach Series, four rounds of competition that began June 19 and finished June 22. 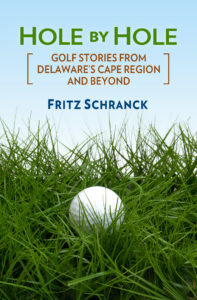 The Philadelphia Section of the PGA runs the Tour, which includes a Junior PGA Championship to be held July 10. The boys will play at Concord CC in Chadds Ford, PA, while the girls and 12/Under juniors will play at Penn Oaks GC in West Chester, PA. The first Beach Series round was the Rehoboth Beach Junior Open, held at Rehoboth Beach CC June 19. Hannah Lydic of Ocean View, DE won the Girls 13-15 category, with her sister Sarah in second. Sawyer Brockstedt won the 9-hole category at the Philly PGA Junior Tour Beach Series tournament at Kings Creek CC June 20. Sawyer Brockstedt of Rehoboth Beach took fifth place in the combined 12/Under group. Jacob Gabbard and Lynden Prosser, both of Lewes, also played in this group. Nolan Brown of Rehoboth finished in 12th place in the Boys 16-18 category, with Dane Palmer of Lewes tying for 14th. Michael Bollig also played in this group. Kings Creek CC hosted the Series on June 20. Hannah Lydic won first place again in the Girls 13-15 category, with her sister Sarah taking second. Brockstedt won the 9-Hole Division on her home course. The Series moved to Bear Trap Dunes for the June 21 round. The Lydic sisters again took first and second place in their division, this time on their home course, and in the same order. Brockstedt finished in third place in the 12/Under group. The June 22 round at Baywood Greens was the qualifying tournament for the Junior PGA Championship. The Lydic sisters easily qualified, winning first and second yet again. 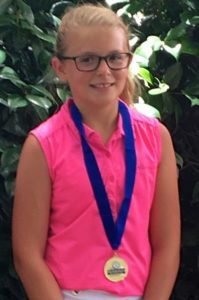 Brockstedt finished in second in the 12/Under category, and also qualified for the Championship. I received a small case of SwingOIL at the Cape Gazette offices, shortly before I left for Florida for the PGA Merchandise Show in Orlando last January. The folks who set up my interview at the Show with Thomas Healy, the CEO of the dietary supplement company, wanted me to sample the three-ounce pouches before I left. The little drink comes in three flavors–orange, lemon-lime, and strawberry-banana. I chilled a few packets, and tried two of them before heading south. They had a pleasant flavor, a bit like Hi-C or Kool-Aid, but they also had a slightly slippery mouth feel. Although jarring at first, I quickly became used to it with the second packet. Jason Day drinks a pouch of SwingOIL before his practice sessions, according to the folks at the dietary supplement company. That sensation was the first thing Healy and I talked about when we chatted at the SwingOIL booth. Healy said, “That’s what we were going for. I wanted a little viscosity.” Based on the responses he and the other SwingOIL reps were making to the golf pros at the booth, I think I know why. Several times I heard the phrase, “It’s not an energy drink,” like the little 5-hour bottles found at WaWa and Royal Farms stores. From those comments and others I concluded that the product’s mouth feel is a way to distinguish this dietary supplement from the energy drinks as well as Gatorade or similar sports drinks. If SwingOIL seems a little medicinal, that’s probably better than thinking of it as an adult juice box. Healy also said they were trying to find a good way to deliver a series of 7 extracts and herbs that are demonstrably helpful to golfers. SwingOIL’s Strength Matrix is made up of Taurine and Citrulline Maleate. Taurine provides an energy boost without sugar, and citrulline assists in recovery. The Focus Matrix elements are Ginseng extract and Rhodiola Rosea extract–the ginseng to help with focus, and the rhodiola to reduce stress. The Flexibility Matrix includes more familiar ingredients, such as Glucosamine and Chondroitin, as well as Turmeric extract to reduce inflammation. Several golf pros visiting the booth gave the product high praise, claiming it helped them as well as their members. The packets are easy to store, and can be frozen. Healy is very pleased that PGA Tour golfer Jason Day incorporates SwingOIL into his practice regime. According to Healy, Day drinks a packet about a half-hour before he hits the range. I know folks who do the same thing with a few Advil or Tylenol. Frankly, this item seems a lot safer in the long run than popping pills. The Kings Creek Ladies 9-Hole group played an individual “Far Out” game June 21, in which all par 5 scores are cut from the total. Jeanne Drake won the first flight, with Mary Mezger in second and Carole Ellison in third. Gail Petren won the second flight, with Kathy Nave taking second and Theresa Derville in third place.